There is extremely limited public parking in Julia Davis Park during Art in the Park. Limited handicapped parking is available (details below). Entry from Captiol Blvd. will be limited to handicap permits and authorized vehicles with special access passes. Please consider walking, biking, or using our FREE Shuttle Buses with convenient stops in the downtown area as well as the Boise Towne Square Mall. Friday & Saturday | 9:30 a.m. – 8:00 p.m.
Sunday | 9:30 a.m. – 5:00 p.m. Shuttle buses run continuously (approximately every 30 minutes) from the north side of Julia Davis Park to the parking locations listed below. Look for the yellow school buses with the Art in the Park signs. 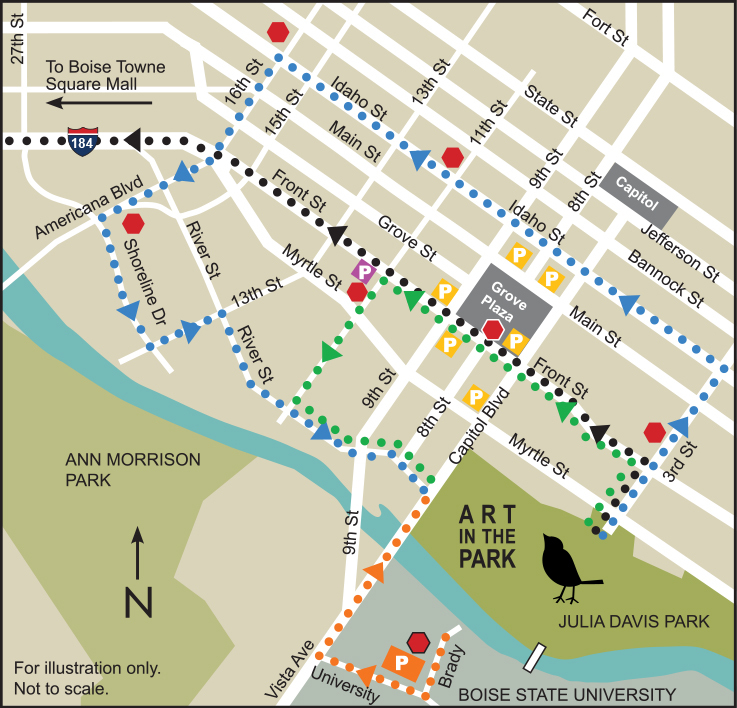 FREE Art in the Park Shuttle Parking, made available by Boise Towne Square, will be available in the Northwest parking lot of the Boise Towne Square near Dillard’s and Applebee’s (see map at right). Please be mindful to park your vehicles near the outer perimeter of the parking lot and walk over to the bus stop area located in the same parking lot. Overnight parking in not permitted. Convenient bike parking is located just off the greenbelt at the southeast and southwest corners of the park, as well as adjacent to the Idaho Black History Museum. Limited handicapped parking is available in the marked lots near the Rose Garden and Zoo Boise. Please use the Capitol Boulevard entrance and have permit visible. Note: License plate number needed for payment kiosk. Select the Art in the Park rate during the last step of checkout.